If you want to add a news story to your website in the WCMS, click the Plus icon and look in its menu for a "Page with a News Story" item. If your site has this special news story page feature, you can use it to add information about a particular news item, and the content will be automatically formatted for your site. You can either add the news story as a new page to your site, or link to a page in another website. The headline and date of the story will automatically appear in a news index page in your site that displays a list of all the current news. If you chose to add the story as an internal page, the first paragraph of the story will appear in the news index page. You can make a news story inactive without deleting it. Click on the Plus icon in the top navigation bar, and select Page with a News Story. The Section Title and Page Title should be pre-filled with "News & Events" as the section title and "Recent News" as the page title. The news_menu or news-events menu should already be linked under the Block label. This page will be "Active" by default, but you can select "Inactive" if you do not want the story to appear in the page that displays all the news headlines in your site. Select the date for the news article. In the Headline field, type the headline for this news story. Now you must choose whether you want to link to a news story in another website, or add this news story as a new page: If you want to link to a news story in another website, fill in the "External URL" field with the complete link. The link will be added to the headline in the page that displays all the news headlines in your site. 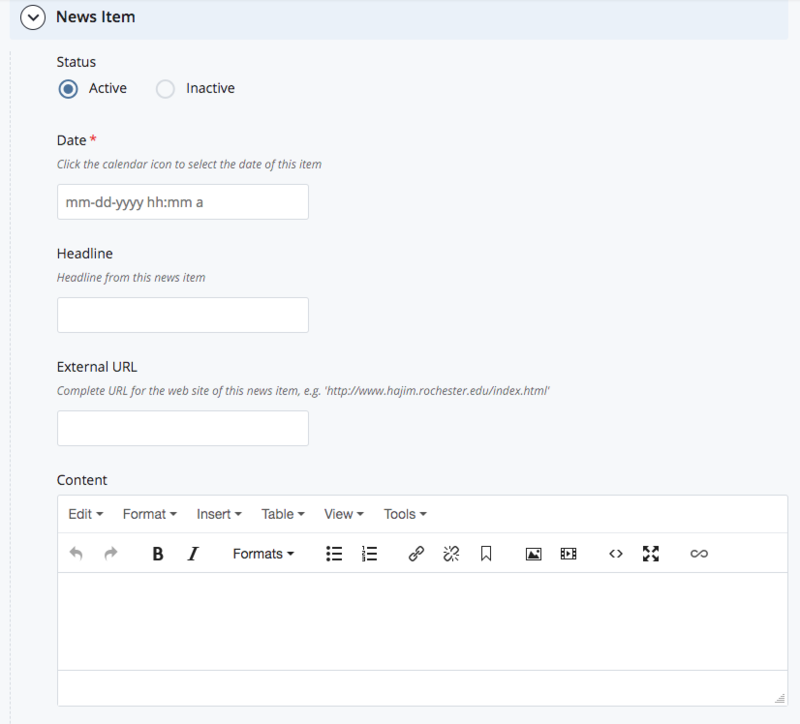 Or if you want to add this news story as a new page, then type the content for your page in the WYSIWYG Content field. A link to this story will be added to its headline in the index page that displays all the news headlines, and the first paragraph of the content will be added below the headline. You must press the Return or Enter key at the end. In some sites, you also have the option of adding a small photo to your news story by linking to a photo that you already uploaded in the WCMS. The option to link to an image will appear below the WYSIWYG content area. Click Save & Preview then Submit. The new page will automatically appear in the appropriate "news" folder in your site. Click the Cloud icon to publish this news story page. Also, publish the page named "index" inside the news folder where you created the news story page. This page will automatically show a list of the headlines and dates of all the active news stories in this folder. For any stories that you added as a new page (i.e. not a link to an external site), the first paragraph of the story will appear on this index page. If your site has any other special features linked to the news stories, you may need to publish more. For example, the Hajim sites are designed with a special home page feature that displays the most recent news stories, so the site's home page must be re-published every time a new news story is added. TIP: Your news story page will be saved in the WCMS after you click Submit, but it will not appear in your website until the page is published. In addition, you also need to publish the news index page that displays your news story headlines in a list. The figure below shows part of the form that is used to edit a news story page in the WCMS.